Sure. The Oklahoma City Thunder instantly became a super team when they successfully received Carmelo Anthony and Paul George in two separate deals during the buys and exciting off season that rocked the NBA. On the other side, Kyrie Irving's trade request was granted as he was sent by the Cleveland Cavaliers to the Boston Celtics. While that trade may have been one-sided considering the number of players that Celtics lost which included Isaiah Thomas, look at where the Cavs are right now. Then look at where the Celtics are after their game against the Thunder. Who has the better standing as of the moment? As it turned out, the trade that sent Irving to the Celtics has been benefiting Boston more than it's benefiting the Cavs as Boston convincingly beat the Oklahoma City Thunder, 101-94 in a game between two teams that have been reloaded prior to the beginning of the season. If you want a simple explanation as to why Oklahoma got its rears kicked horribly, just look at the field goal shooting of their trio of stars. Throughout the game, the defense of the Celtics continuously frustrated Russell Westbrook, Carmelo Anthony and Paul George as they combined for 38 misses- 38 out of the 52 shots that Oklahoma missed in the entire game. In addition to this, Westbrook and company were also shooting bricks from beyond the three-point line. The reigning MVP only nailed 3 of his 7 attempts from deep. Paul George also hit 3 from deep but took 10 shots. Carmelo Anthony was the sorriest of the three, missing all 5 of his shots from outside. Given the fact that Westbrook, George and Anthony are known as heavy shot takers meaning they have the tendency to take as many shots as they can, the Celtics did a good job in making sure that the trio missed most of their opportunities especially from outside- all while also making sure that they were scoring efficiently form their end. By the end of the night, both squads ended up 13 threes apiece but, with the Celtics shooting better from rainbow distance. How good? Al Horford, who had 20 points, made all 4 of his three-point attempts while rookie Jayson Tatum hit 2 long-distance bombs, en route to a 13-point outing. Irving, for his part, had 3 made threes on 7 attempts. What could you possibly ask for? That's classic Kyrie Irving for you, folks. The win improved Boston to 7-2, the best record in the Eastern Conference in the early goings of the season while the Thunder dropped to 10th place in the West, at 4-4. 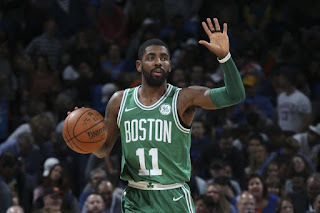 While chemistry can play a role in the struggles of the Thunder, chemistry seems not to be a problem for the Celtics as Kyrie Irving found no difficulty in blending well with his new team. Why? The Celtics are on a roll as we speak, winning 7-game winning streak after losing their first two games to open the regular season.